When I commenced writing the following pages, I only intended them for my own offspring. 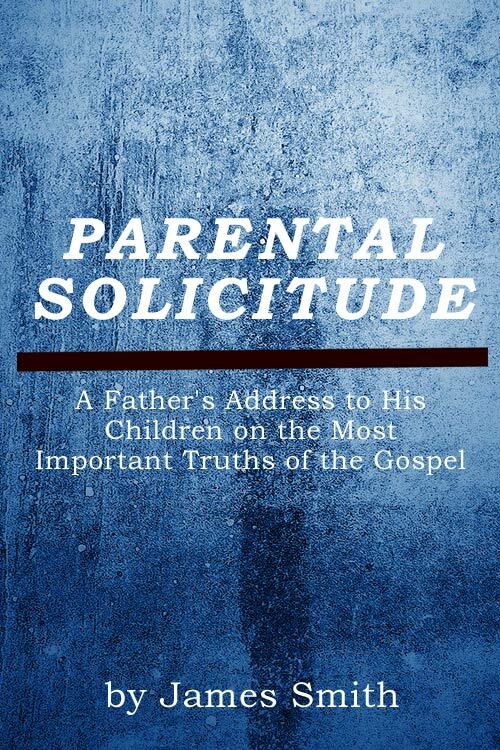 Deeply impressed with a sense of my own responsibility as a Parent, and with the value of the souls of my children — I began this address with earnest prayer to the God of all grace to make it useful to their souls. It was written with a hope to affect the children's hearts, not to meet a critic's eye; but I have since thought that the Lord in his infinite mercy may use it for the benefit of some besides my own family — therefore I have allowed it to be published just as it was written. I am conscious that many objections may be raised against it, but having stated my only design in writing it, and allowing it to be printed, I am not anxious to anticipate objections, which may be made by others, or reply to any that arises in my own mind. To the blessing of Almighty God I commend it, and pray that it may not only be the means of benefitting my own family and rejoicing my own heart; but that many families may be benefitted and that many a parent's heart may through it have occasion to sing for joy; nor do I stop here, but hope that the glory of Jehovah may be advanced by such a feeble instrument, and the Lord Jesus Christ be made known, endeared to the heart, and be honored by the praises of many who are now in darkness, ignorance, and sin. Any parent who approves of the sentiments, may adopt it as his own, and put it into the hands of his children as expressing his own feelings, and containing his own admonitions. And to every such parent especially I would say, as you value the present and eternal welfare of your children, and of the children all around you; be earnest, frequent, and persevering in your prayers at a throne of grace, that the Lord would bless this, and every other attempt to benefit the rising race. I cannot think, that parents in general, sufficiently realize the importance of using every means, and watering the same with earnest prayer, for the benefit of their dear children. We know they must be saved — or lost; but do we feel in reference to our children as the great Apostle Paul (who learned his divinity by express revelation from God, Galatians I. 11, 12; who had been up in the third heaven, 2 Corinthians 12 1-5;) did in reference to his brethren the Jews, Romans 9. Do we manifest the same anxiety for our own, as he did for others, 1 Corinthians 9:19-27? Alas! it is to be feared that many are lamentably deficient! Gracious God! stir up the minds of your people to a befitting concern for the eternal welfare of their children, and for your glory and praise! If any are tempted to despise, to dispute, or to condemn this feeble piece; I would only say, God has generally chosen weak things, things that are despised, and things that are not, to bring to nothing things that are; that no flesh may glory in his presence; and he has ever proved that the work of a sinner's conversion from darkness to light, and his translation from the kingdom of Satan into that of his dear son; whatever may be the means employed, is not by might or by power, but by the Spirit of the Lord Almighty. If any of my brethren in the Ministry should spend a few moments in perusing these pages, I would entreat them to read as Ministers of Christ — not as critics; and put up a prayer that the blessing of the Lord may attend them. To all who in every place, call upon the name of our Lord Jesus Christ, into whose hands this publication may fall, I would say: Brethren, pray, that so far as these pages contain the Word of the Lord, they may have free course and be glorified. The wonders of redeeming grace!